Call Me On The Yacht: How Do You Say "Waste of Money" in French? 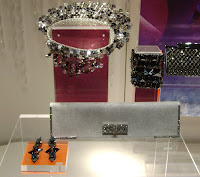 I know how to say it in pictures: the Colette x Gap pop-up shop AND Swarovski's fall collection. 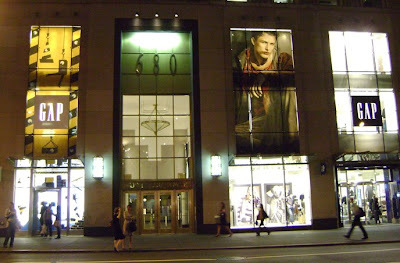 In addition to being huge wastes of money, they are also both eyesores up on Fifth Ave and Madison Ave, respectively. On Colette: In the interest of full disclosure, I have never been one to have heart palpitations over new Colette collabs, and am heavily skeptical of their image as a tastemaking store. Still, I was willing to give their GAP shop a chance because of my fascination with pop-ups. Immediately after entering the store (around 7.30pm on a weekday), I was struck with how un-special the space looked. It didn't make you want to shop; the place was way too bright and none of the displays looked inviting. While I am fully aware of the Colette Paris shopping experience, and how it is not meant to be typical in any way, I was still terribly turned off. I picked up the shoelaces - egh. I sniffed at the Comme des Garcons - nothing I haven't already gotten from Barneys. I almost took a closer look at the keychains and pin until I overheard a sales associate quote the pin price to another customer: $110. If I won't pay $320 for a truly spectacular skirt at J. Crew because then I'd be paying $320 for a skirt at J. Crew, then I sure as hell am not going to find a $100+ GAP keychain to be a necessary accessory. Then I passed the erasers and pencils. This is the crap most people will be purchasing, just to have participated in the collab. A small, yellow foam duplo-looking block with the Colette logo was puzzling; it had no function except to cost $16. My overriding impression of the store came as a whispered exclamation as I glared down at the post-it notes: "It's like they ordered stuff from a promotional items catalog and just had their logo applied." Then I left. 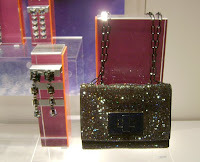 On Swarovski: Go to any mall's Claire's store and ask to see the "prom jewelry" in the locked plexi cases. Then add two zeros onto the price of each item and voila - it's Swarovski. I was just wandering around Madison Ave as usual when I walked by their horrendous fall collection, whose muse could be none other than Ashley Alexandra Dupre. I mean, didn't Victoria's Secret have that weird crystal tie thing in their catalog five years ago? Anyway, I've put the images below for you to form your own opinion.